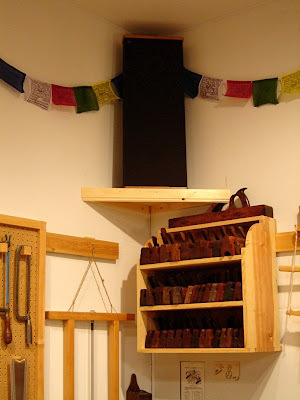 Next on the house project list was finishing up around the woodstove platform. 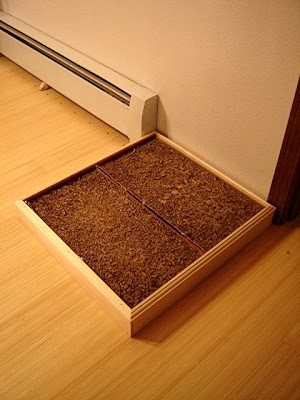 When I lay the flooring, I left a gap around the platform for two reasons. 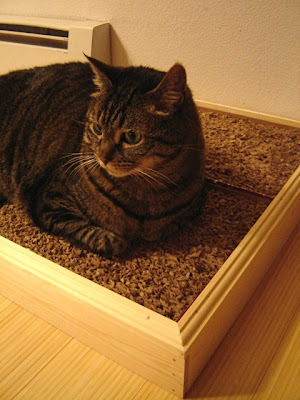 First, a small gap was needed around all edges of the flooring to allow for expansion. 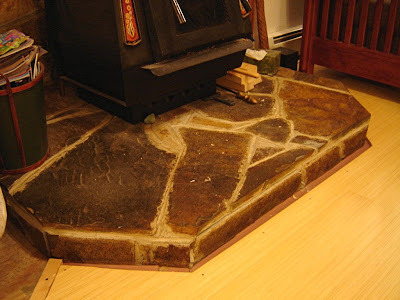 Second, I knew I was going to put some kind of cap or trim around the stones, so I didn't need to be precise with the flooring itself - which explains why the gap is so much larger than needed for the expansion factor. 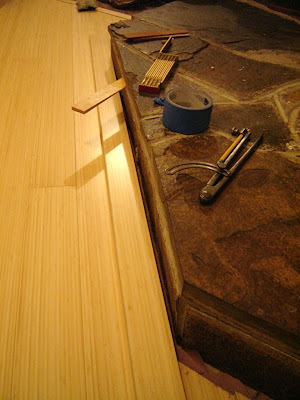 I decided to make the trim out of the same bamboo as the floor - but narrower. 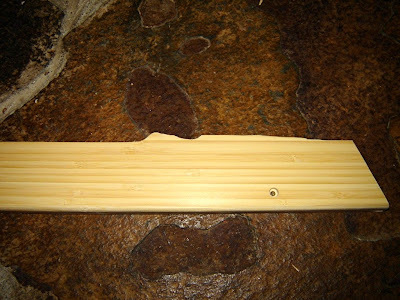 Now the bamboo is hard stuff, plus it is coated with an anti-scratch layer of some sort (aluminum oxide? 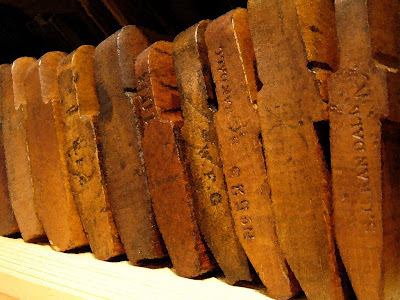 ), and when I ripped this by hand in the past, it really wore out the saw, and me too. This time I decided to work a little smarter and use a different set of tools. First, I picked my width. 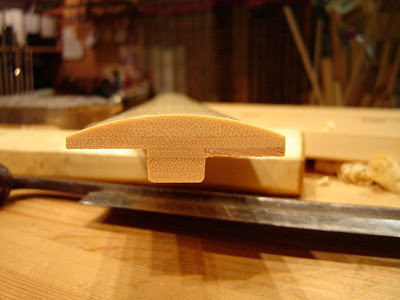 The flooring has two shallow grooves on the back, and I used one of these as a handy reference for splitting out, or riving, my trim stock. I like to start this job with a hatchet rather than going directly to the froe. 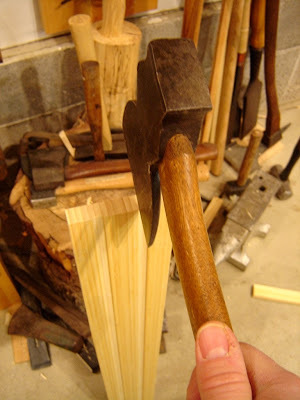 Hatchets are awesome, and underutilized tools in the shop, but they are scary and need to be respected. 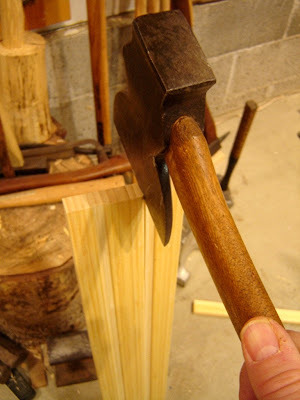 Always chop well below the hand that is holding the work. When you are starting at the top, you have to get tricky. Never hold the top of the piece with one hand and chop right next to it. This is a good way to lose fingers. 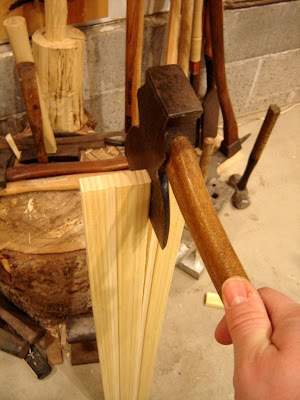 Instead, what I do is hold the work in my left hand and carefully place the hatchet edge where I want to start the split. Then I lift the whole thing off the ground as one unit. As I drop it back to the ground my left hand pulls away, the bottom of the board hits the ground, and the hatchet, which has never separated from the board, drives a short way into the end of the board. With the stock ready, I could begin the much more precise job of scribing the trim to match the uneven surface of the rocks. 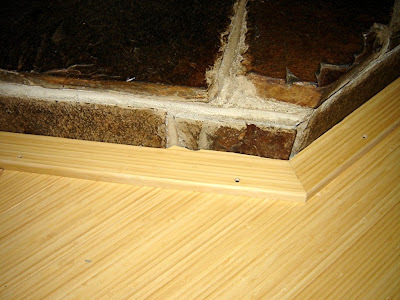 Keeping the trim parallel to the flooring, I moved it towards the rocks until it made contact. To keep it in place while I worked, I taped it down with blue painter's tape. Then, using the dividers - point on rocks and pencil on trim, I carefully scribed the contour of the rocks onto the top of the trim. Here's a shot of the setup - the shim is holding a loose rock in place until the trim takes over that job. 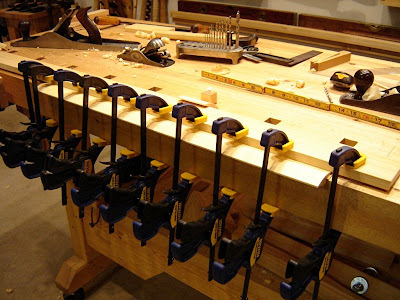 Then out to the shop for a little scrub plane and a lot of drawknife action. 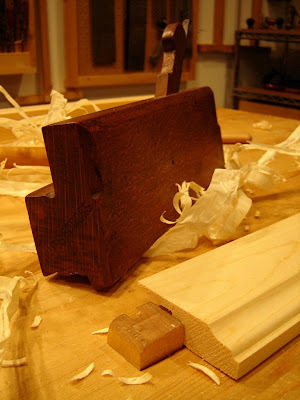 Using the scrub plane (after the first piece, I switched to doing the whole job with the drawknife - just plain faster...or is it plane faster...) I created a back bevel on the trim. 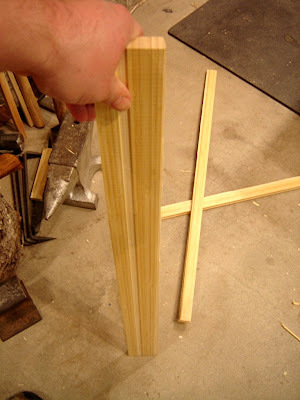 The pencil lines help me keep track of how close I am getting, and was a step I didn't need after switching to using the drawknife for this part. 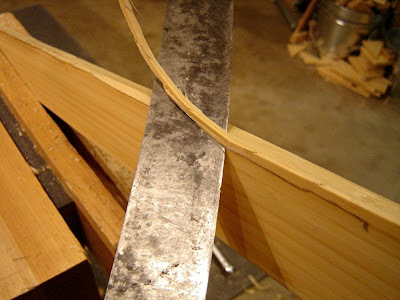 Next, with the trim held in the bench vise (for edge work on flat stock, I tend to use the bench vise - most other times I use the shavehorse) and using the drawknife bevel down, I cut down to the scribed line. 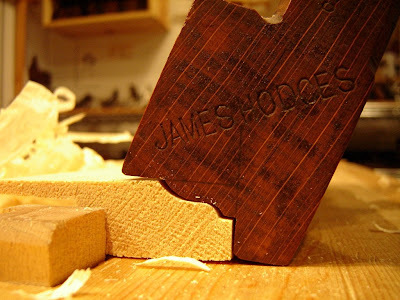 I do this on an angle, creating another bevel on the face side of the board. 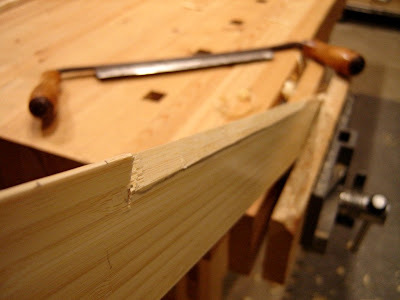 Then I switch to the back side again, and cut the final relief bevel behind the cut edge. This does not need to be very dramatic, a shallow angle works most of the time. If I did it right, when viewed from dead on, I should see only the scribed edge. In this shot, you can see I have a little more relief work to do over on the far right. 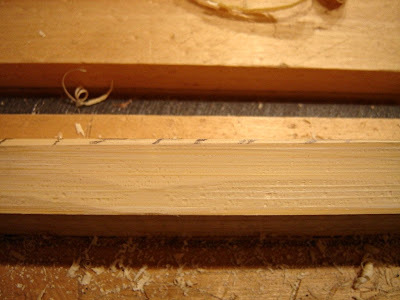 The drawknife is a powerful tool. It is fast, accurate, and if you are using your whole body, it has tons of control. 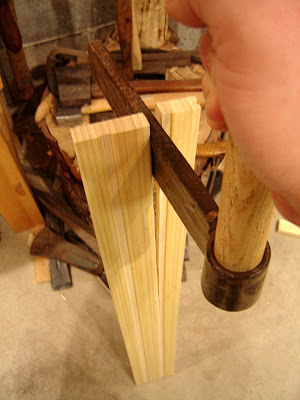 I have done similar jobs using a coping saw, and I will never do that again! This method was so much easier and cleaner too. Now that the trim is done, I can start working on the fence that will rest on it and will hopefully keep Teague away from the rocks and hot woodstove. Hopefully. He is already starting to show signs of being a climber! One of the great joys of a human-powered shop is being able to listen to music while working. For years, I listened to my jazz CDs on a cheesy little player sitting on the shelf over my desk. But no longer! Cry 'Havoc!' and let slip the dogs of Jazz! Anyway, I dug up the stereo system that I first bought way back in college. It's old, but man does it still sound good (of course, almost anything would sound better than the little cheese box). The only problem was that the speakers are the old-school kind - big, heavy, tower-types. I got by for a while with them just sitting on the shop floor - but continually having to move them out of the way became tiresome. Time to build some shelves. The shelves are pretty no nonsense. 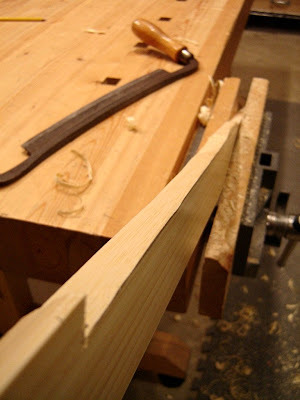 The only part that required more than sawing was the face edging. This got a rather large rabbet to support and conceal the plywood shelf, and a reverse ogee moulded edge to give it an attractive shadow line. You can just make out the rabbet hiding behind the dog in the shot below. 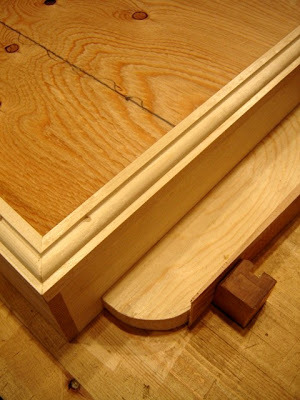 For the moulding, I used an E. Preston and Sons (England) sash plane. 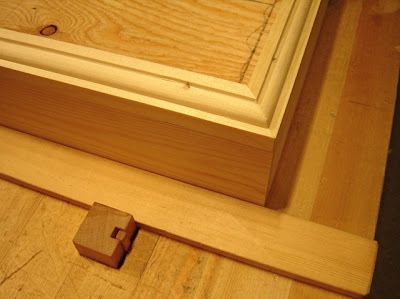 At one time this would have been used to make window parts, but since I don't have any plans to make my own windows (at least not yet...) it now lives a new life of cutting moldings on board edges instead of sash bars. 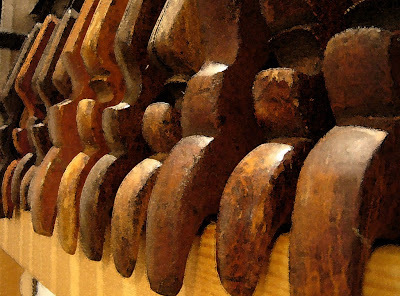 This plane is one of a matched pair, numbered 1 and 2 that the original owner would have used together for greater efficiency. One of the pair would have its iron set coarse for quick but rough stock removal, while the other would be set fine for final smoothing. Since I don't spend my days making hundreds of the same parts, I don't really need this system, and I just use the fine one most of the time. So I decided it was time to really finish the bamboo floor. The floor itself has been down for a while, and we love it, but we have been living without transitions. Well, there was a transition from the hall to the bathroom, but it was a strip of blue painter's tape. Not exactly "finished". 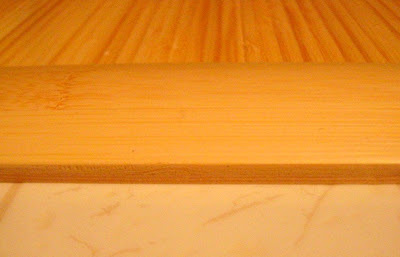 I used the manufacturer's bamboo t-strip for the transition from the dining room to the kitchen. That went fine, especially when I switched from the electric cordless drill to a Yankee brace. Plenty of torque, loads of control, great "feel" and no split bamboo. Why did I try the Makita in the first place? Dope Slap number one! The bathroom transition was more of a challenge. The bamboo in the hallway, and the vinyl in the bathroom were not level. The vinyl was 3/16th lower. If the t-strip does not sit level, evenly supported on both sides of the "t", it splits when you step on it. Hmm. My first thought was to plane the hall side down by 3/16th. But that would weaken the already thin top and also make the curved top asymmetrical. Hmm. I could shim the bath side, but it would be visible along the edge. And what did I have that was 3/16th thick? I actually started digging around for some thin birch ply...Dope Slap number two! I could just make what I needed. The other side, with raking light, and you can clearly see the saw tracks. 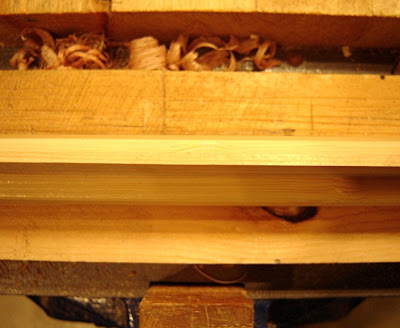 I flip the piece edge-for-edge as I resaw, allowing the existing kerf to guide the saw on the side away from me. Half-way down I flip the board end-for-end, and cut down until I reach the kerf coming in from the other end. 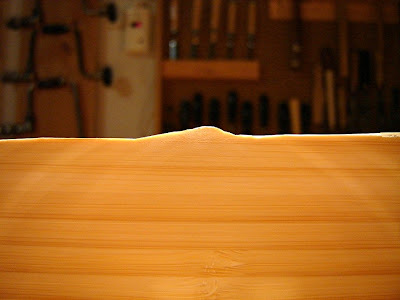 This photo shows the middle of the stock, where my two cuts met. The small, raised triangle at the bottom was the last part to separate. 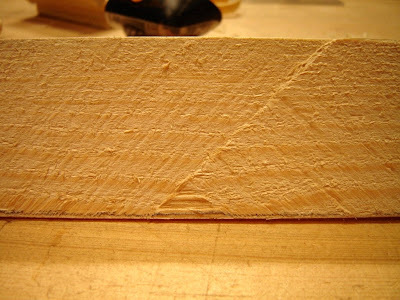 It never got cut - it split off due to lateral pressure from the saw blade. As you can see from the tracks in the upper right, I was starting to wander off and when I twisted slightly to correct, the blade just popped the remaining connection. 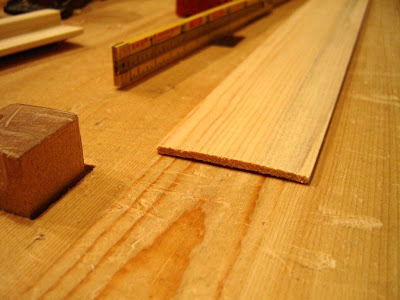 After planing the strip smooth and to final thickness, I needed to glue it to the t-strip. The curved, slippery surface made this a bit of a challenge, but here's what I finally came up with. It's times like this that I am glad I built my bench without a front apron. I really like it, and you have to get pretty close to see it, even when you know it's there. 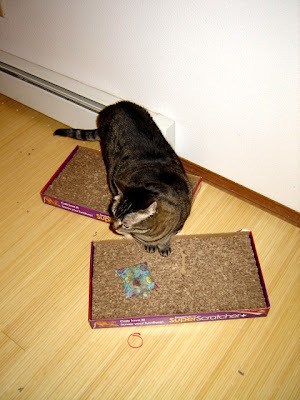 See how those scratchers aren't lined up properly? That will never do! Louis is a persnickity cat! Does he still complain? Yes! "What took you so long?" 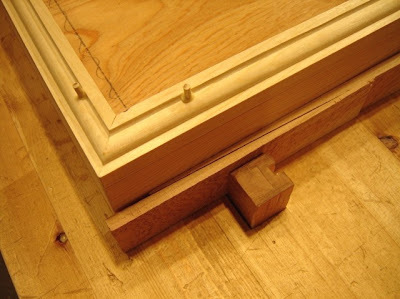 It's just a simple tray with rabbeted and pegged corner joints, plywood bottom trapped in grooves, and mitered, applied moulding. The moulding was nailed and glued. After the glue dried I sunk the nails even further, drilled out the nail holes down to the heads, and then plugged the holes with dowels (bamboo skewers actually).